Anorak News | Chelsea and Arsenal: Wenger moans, Mourinho hurts, the match gets replayed? Chelsea and Arsenal: Wenger moans, Mourinho hurts, the match gets replayed? Arsenal manager Arsène Wenger is not yet over his side’s 2-0 defeat away to Chelsea last Saturday. 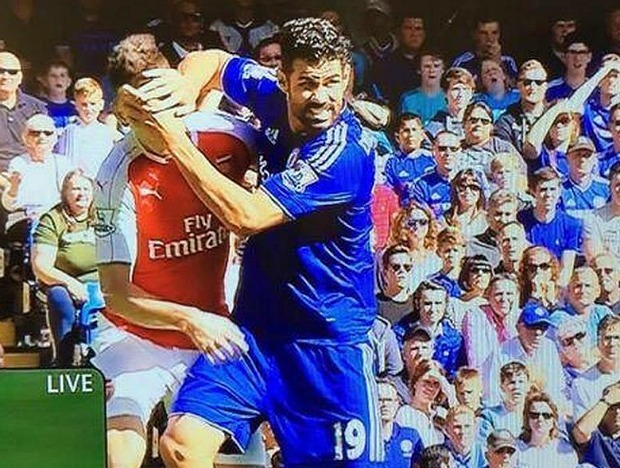 The red card referee Mike Dean showed to the Gunners’ Gabriel has been rescinded by the FA – and Chelsea’s Diego Costa has been handed a three-match ban for the red-card he should have earned – but Wenger says it repairs only “5 per cent of the damage” done. “[Revoking Gabriel’s red card] just shows they decided after the game what should have happened during the game. They have repaired 5 per cent of the damage that has been done to us. Instead of us playing 11 against 10, we played 10 against 11. It does not help us too much [now]. Maybe it would be best to replay the match?